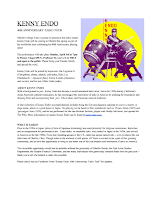 This performance by world renowned taiko artist, Kenny Endo, is free and open to the public. Please join us! "A jazz percussionist and early innovator in Japanese taiko, Kenny Endo's adventurous spirit stretches the taiko genre incorporating influences like funk, jazz, Afro-Cuban & Hawaiian, with roots firmly grounded in tradition." This performance has been made possible by the generosity of Oberlin Shansi, East Asian Studies Department, and many individual donations.